Born in Cumbria in 1893, James Wightman was the son of James and Sarah Jane Wightman. His father was born in Ireland, and worked as a coal miner, before becoming the innkeeper at the Hope Inn, Whitehaven. When James Snr died in 1904, his wife Sarah continued with the business. At that point, Sarah Wightman had five children to support. The oldest was a daughter, Sarah Grears, then came Samuel, Tom, James, John (‘Jack’) and the youngest, Charlie, was still a toddler. Another brother, Harry, had died in 1900, aged just 10 weeks.James attended the local Moresby Parks Junior School, before moving on to the Whitehaven Country Secondary School. Following in the footsteps of his sister, James then became a ‘Pupil Teacher’ at St. James Boy School between 1908 and 1910. James had already shown his qualities as a football player, winning several trophies at Moresby. His older brother, Samuel, had taken a slightly different route. Employed as an above-ground fitter in the coal industry, ‘Sammy’ was also a keen footballer. He’d signed for local Lancashire Combination side, Workington AFC, before moving to the newly formed Merthyr Town who were then playing in the Southern League. Presumably, Sammy had come down for work and Merthyr were eager to sign him up. Sammy had no doubt made a big impression, as by December 1909 the then mighty Middlesbrough, a Division One side, came in for him. The signing fee was £100 (Boro had previously broken the English record when they spent £1,000 for Alf Common), and an appearance at Penydarren Park from Middlesbrough. The game took place in March 1910 to a packed house, and Sammy was well received by the Merthyr faithful. By the time Sammy was being signed by Boro, James had settled into student life at Carmarthen Teacher Training College, now Trinity College at the University of Wales in Carmarthen. Excelling at sport, James captained the college rugby and football teams and was also a keen cricketer. Indeed, James was later described as being ‘acknowledged as the best all-round athlete of the Training College, and a first-class footballer’. For Sammy, playing for Boro was not the dream move he may have expected it would be. During 1910, his first full season at Boro, the club was hit by a scandal when Newcastle complained they were being asked by Boro to throw a match. It was match-fixing, but more to do with influencing a local election of a Boro board member rather than football. A disaffected Sammy left Boro and dropped back down to the Southern League to sign for Luton Town. James and Sam’s younger brother, Jack, also went to Moresby school and played for the school football team, and for the village side. He would later apprentice as a linotype operator for the Whitehaven News, before moving to London to continue his career there. Little is known of Jack’s career in London, but when War broke out in 1914, he enlisted into the Royal Irish Dragoons, but was then drafted into the 2nd Squadron of the Machine Gun Corps as Private 41292. While in the Machine Gun Corps, he joined his squadron’s football team. Playing in his usual left-back position in defence, Sammy was in the Luton Town side that opposed Brighton & Hove Albion in a Southern League match on 8 April 1912. Clearing a ball into touch from the wing, Sammy was challenged by Brighton’s Fred Goodwin. What happened next was ultimately settled at the coroner’s inquest. Sammy cleared the ball before Goodwin could get to it, and it appears Goodwin followed through and his raised foot accidentally caught Sammy full in the stomach. Eventually, Sammy was able to walk off the pitch with some assistance, and the referee allowed the game to continue without believing it warranted a free-kick for Luton. Unfortunately, Sammy’s condition deteriorated and the doctor advised him to go home to rest. With his health now rapidly declining, he was admitted to the local hospital. He was told he would probably not recover from the injury and should make a statement. The police were called to take his deposition, and Sammy passed away at 2pm on 10 April 1912, aged 23. The coroner’s report stated Sammy had suffered a secondary infection after tearing open his small intestine, and the later inquest completely exonerated Fred Goodwin, despite Sammy’s deposition that he believed it was a malicious challenge. Sammy was transferred by train to be buried back in his hometown of Whitehaven, and the coffin was accompanied by Sammy’s younger brother, James. James resumed college at Carmarthen, and later moved to Merthyr in 1913 to complete his scholastic studies and eventually ended up teaching at the school in Troedyrhiw. Almost inevitably perhaps, he would soon join the Troedyrhiw football club. Whether by chance or design, already at Troedyrhiw was a chap called Syd Beaumont. Syd had previously played for Watford and had featured in the local derbies with Luton Town when Sammy Wightman was part of the opposition. There’s no evidence, but there seems to me to be very little chance James and Syd didn’t know the connection between them once they both joined Troedyrhiw. Perhaps the connection was known before they joined Troedyrhiw? I don’t know. Football had been played in Barry almost since the creation of the town in the late 1880s, and the Barry District side was an early powerhouse of football in south Wales. Before Swansea. Before Cardiff. Before Newport. Maybe not Rogerstone. Yet, with Cardiff going from strength to strength in the Southern League and Barry quickly becoming a football backwater in the Western League, the Barry Association Football and Sports Co. Ltd was registered in November 1912, and the Barry AFC was born. The club’s ground, Jenner Park, was started in early 1913, and by the summer, the Southern League announced the club and the ground had met the correct criteria. All the club needed were players. With the Southern League accepting Barry’s application and new ground, the Barry board wanted to sign the best players they could. Among the first to join up were both James and Syd. They were both obviously already highly regarded as Syd joined as player-manager while James, now 20, became the club’s first captain. James captained the side when Barry opened up its new era with a surprise 2-1 victory over Mid Rhondda United, in front of a crowd of around 4,000 at Jenner Park. Barry’s 1913-14 season was underway. Losses to Swansea, Stoke City, and Luton Town soon followed, and one wonders what was going through James’s mind when he played against his brother’s old club. Prior to the match, the Supporters’ Club announced their first annual away trip was to be away at Luton. One must also wonder if this was to show support to James? In February 1914, with Barry struggling for points, Newport County visited Jenner Park for the first time. It turned out to the best game of the season, with not a little controversy. In a frantic opening, County went 1-0 up in the opening minute, with Barry equalising just moments after the restart. County then went 2-1 in the 10th minute before Barry ended the half 2-2. The second half started with a headed goal by a Barry corner, and the goals kept coming. Before the game was an hour old, Barry were beating County 6-2. It’s not reported what actually happened, but play started to get a little rough from that point onwards, and ‘strong feeling’ between the players lead to James punching County’s Butler. He was ordered off the field, but Barry held on to win 6-2 with Bert Millard scoring the club’s first ever hat-trick. A few weeks later, James sealed the points for Barry in a home win over Pontypridd by converting a penalty. This was his only goal for the football club. He also captained the side for the 2-1 win over Swansea at Jenner Park. Barry also defeated Swansea in the South Wales Senior Cup Final, before losing to Cardiff City in the Final. Of the 33 games played in cup and league in Barry’s inaugural season, James played in 32 of them. By the summer of 1914, Barry was preparing for the 1914-15 season, European war, or no European war. As line-up details are pretty scant for the 1914-15 season it’s uncertain how many, if any, matches were played with James Wightman in the line-up. The 4 September issue of the Barry Dock News announced James had been retained, as had Syd Beaumont. Regardless, when War was eventually declared, James enlisted almost immediately. James was 22 when he joined the Irish Guards as a Private, before quickly joining The East Surrey 8th Battalion on a commission. Following training, James and the 8th Battalion East Surreys landed at Boulogne in France, and saw action at Loos, before being posted to the Somme. James makes his first appearance in the diaries of the 8th Battalion after the famous events of the 1 July 1916, on the opening day of the Battle of the Somme. The exploits of the 8th Battalion, and that of Captain Wilfred ‘Billie’ Neville, would later become known as ‘The Football Charge’. By 30 September 1916, it’s reported that James had been awarded the Military Cross for his hand-to-hand fighting and for the quality of his bomb-throwing. James threw bombs for 2 hours before recapturing a trench. One wonders if James learned his bomb-throwing technique while a young cricketer at Carmarthen College! 1916 saw James promoted from Lieutenant to Captain to Major, and by December had been promoted again as Acting Lieutenant-Colonel. Following Colonel Irwin DSO’s injury at the Somme, James had taken over command of the battalion and held the post permanently afterwards. Back at home, there was much pride in the efforts of James at the Front and his various promotions. Barry AFC, unlike many others, was still operating throughout the war, and by January 1917 the club’s officials and supporters were discussing the possibility of honouring James with a testimonial match after the war was over. By 30 September 1917, James had taken the Senior Officers’ Course in Aldershot and re-joined the Battalion, taking over as 2nd in Command of 8th Battalion alongside Lieutenant Colonel Irwin who was the Commander. James and his battalion came under heavy fire from munitions as well as gas on the morning of 4 April. The Battalion’s HQ could see a ‘general withdrawal’ was underway, started by the Australians. The weather was so atrocious, the rifles and Lewis Guns were getting clogged with liquid mud and were becoming unusable. It was estimated that the fire-power was reduced by two-thirds because of the mud, and the Lewis Guns especially being almost impossible to use and therefore the men were left ‘practically unarmed’. By the evening of 4 April, only four officers remained either alive or able to continue in his post. Sadly, James was not one of them. Further recognition of his bravery came a few months later when James was posthumously awarded the Companion of the Distinguished Service Order in the 1918 King’s Birthday Honours Awards. Tragically, Jack was killed on 4 April 1918, the same day James was mortally injured. He was struck by a German shell and died still manning his Lewis machine gun. He was buried, alongside his gun, at Vaire Wood, and a wooden cross erected, before his battalion continued the attack. Jack was later commemorated at the Poizeres Memorial outside the French town of Albert, alongside 14,698 other soldiers with no known grave. Back home in Whitehaven, Cumbria, the boys’ mother, Sarah Wightman, presented St. James Church with a tiled floor, dedicated to her two boys, in 1923. Sarah died in 1941, while Thomas, who died in 1960, was the only son to outlive her. Jason Pawlin was born in Barry and raised on Barry Island. His first match at Jenner Park was during the 1983-84 season. The game that got him hooked on the Town was a big cup tie against Ton Pentre. Town won 7-1, including 4 converted penalties and Clive Thomas as the referee. Jason has been producing the Barry Town United match programme for some years now and is really proud of it. He graduated in History at Aberystwyth and is employed in government communications. 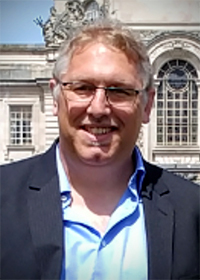 Jason has recently joined the Board of Trade World War One Memorial Research Group, which is based at the Department of International Trade in London. The group's main aim is to research the 305 names listed on the memorial based at Caxton House, London, and make that research publicly available. Jason lives in the Rhondda with his wife Lynne and children Sarah and Lewis.